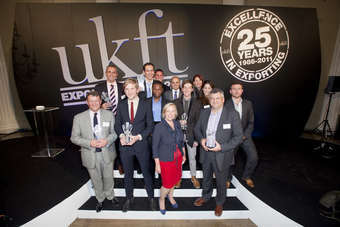 UK Fashion and Textile Export Award winners with Dragons' Den investor Deborah Meaden, owner of Fox Bros, the UK manufacturer behind the West of England tweed brand, who presented the Great Brit Award. UK-based designer Mary Katrantzou was named winner of the the designer business category in the UK Fashion and Textile Export awards today (11 October). The UK Fashion and Textile Association, which organised the awards, said UK designers export some two-thirds of the clothing they produce, with the UK footwear industry selling over 90% of its production around the world. Johnsons of Elgin won the Gold Award; Butterfly Twists won the New Exporter award; and shearling, leather and fur designer Karl Donoghue took the Great Brit award. Brand of the year was awarded to Boxfresh; Christopher Raeburn, who uses re-appropriated military fabrics, was awarded the Rising Star award; and Alex Begg & Co was named the Textiles award winner. Asos won the retailer/ e-tailer of the year award. The Princess Royal, president of UKFT, said the major markets for UK textile and fashion exporters remain the US, Europe, and Japan, but that the sector is seeing increased exports to the Middle East, Eastern Europe, Russia and Australia. "Established markets need to be re-evaluated," she said. The UK Fashion and Textile Association represents the fashion and textile sector both domestically and internationally.